Manitou Mennonite Brethren Church, 1951. Source: Manitou MB Church website. Manitou Mennonite Brethren Church began services in 1927 and formally organized on 6 June 1927 with 30 charter members. Anton Baerg was elected as the first leader. The congregation originated through emigration from the Soviet Union. At first the congregation met in Hazel School north of Manitou. When the congregation outgrew the school, they met in an available machine shed during the summer and in the winter, divided into four groups and met in homes. On 16 October 1931, it was decided to build a church. Once a month, the congregation held a youth service. The present sanctuary was built in 1967 and dedicated on 25 June 1967. The church had a 50th anniversary celebration in 1977. 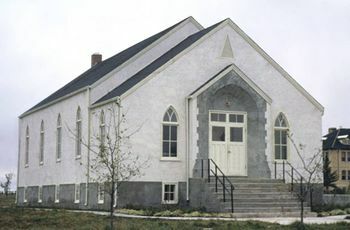 Another building was purchased in 1983 and attached to the original building for Sunday School. The name was changed to Manitou Christian Fellowship in 2018. Centre for Mennonite Brethren Studies (Winnipeg, Manitoba). "Manitou MB Church." Mennonite Brethren Herald (4 April 1986), (27 May 1988): 40; (22 October 1999). Toews, John A. A History of the Mennonite Brethren Church: Pilgrims and Pioneers. Fresno, CA, 1975: 162. Available in full electronic text at: https://archive.org/details/AHistoryOfTheMennoniteBrethrenChurch. Centre for Mennonite Brethren Studies, Winnipeg, Manitoba. Volumes 423, 425–430. Giesbrecht, Ed. "Manitou Mennonite Brethren Church 90th Anniversary Celebration June 25, 2017: Looking Back: A Presentation on the History of our Church." Church website. Froese, John P. and Marlene Epp. "Manitou Christian Fellowship (Manitou, Manitoba, Canada)." Global Anabaptist Mennonite Encyclopedia Online. March 2012. Web. 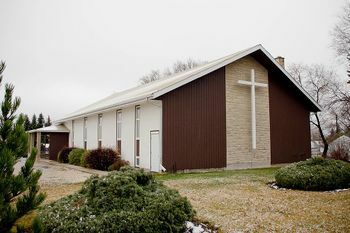 24 Apr 2019. http://gameo.org/index.php?title=Manitou_Christian_Fellowship_(Manitou,_Manitoba,_Canada)&oldid=163406. Froese, John P. and Marlene Epp. (March 2012). Manitou Christian Fellowship (Manitou, Manitoba, Canada). Global Anabaptist Mennonite Encyclopedia Online. Retrieved 24 April 2019, from http://gameo.org/index.php?title=Manitou_Christian_Fellowship_(Manitou,_Manitoba,_Canada)&oldid=163406. This page was last modified on 9 March 2019, at 01:51.